My desk full of piles stressed me out on the day of our Valentine parties. My desk full of piles stressed me out again the following Friday. Remarkably, there are also flowers this month. You can see them in the desk piles (how about that stunning orchid that a student who moved to another school gave me?!? I hope I can keep it alive...I've never had an orchid before...) and as a centerpiece for the author visit breakfast. My favorite, though, is the crocus that a squirrel must have transplanted into the geranium that lives on my front porch in the summer and my classroom windowsill in the winter. In spite of the piles of snow outside the window, we had a sign of spring-to-come. 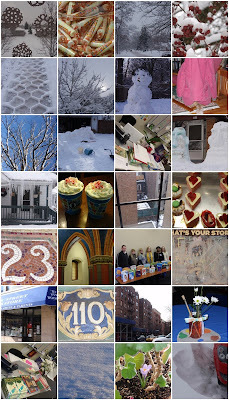 Last year's February Mosaic was quite different from this year's. Sigh. And with March just a day away, it seems completely unlikely that we will EVER see buds and blooms and sprouts again. But since the crocus in my classroom can believe in spring, I guess I can, too! I rarely listen to commercial radio, but when I do, it always seems like there is a song waiting there just for me. It last happened in September of 2009. Enjoy the words, and if you want to hear it, go on over to YouTube. Jone has the Poetry Friday roundup today at Check it Out. I missed browsing last week's roundup because of the Dublin Literacy Conference (and the ensuing chaos of "the week after," which included an evening of culture [the Peking Acrobats--wow!] and an evening of rescheduled-because-of-snow parent conferences). I'm looking forward to TWO weeks worth of poetry this weekend! The Dublin Literacy Conference was a huge success. The energy started with Friday night's dinner. The speakers and committee went out and had great conversations (as well as great desserts). It was a great way to start the weekend. Saturday's conference was energizing. My head is still spinning from all of the new thinking and inspiration. If you missed Monday's post, Mary Lee summarized the day for us. And in Tuesday's post, I shared my own plans for creating a Tech Playground for families like the one we had set up for teachers at the conference. So many of our blogger friends have posted about their experiences so I thought I'd round up some people's reflections about the conference. I think you will enjoy these whether you were able to attend the conference or not. Tim Tyson was an amazing keynote speaker. I heard him 2 years ago at NCTE's Annual Convention in San Antonio and his talk inspired me to commit to moving forward in my own thinking. I think he did the same for the participants of the Dublin Literacy Conference this week. Dr. Tyson screencast his entire speech and has created a temporary page to share many of the resources that he discussed in his keynote and featured session. Lisa at Two Learning Journeys was Tim Tyson's Dublin Host for the day. She reflects on all that she learned while spending the day with him. Kevin Hodgson was another one of our wonderful speakers . He ran sessions for teachers and a very popular Stopmotion session for families. Many of his blog fans were VERY excited to meet him in person at the conference! Kevin posted several reflective posts about the conference--one about the family stopmotion session and one on the conference in general. He also shared his thinking around a conversation he had with Tim Tyson in "When a Whole School Blogs". Cathy Mere, another presenter at the conference and author of MORE THAN GUIDED READING shared some thinking and resources about the session that she did with Deb Frazier on self-assessment and student ownership. She includes her Powerpoint presentation as well as other documents. Julie at Raising Readers and Writers posted her initial thoughts on the conference as well as her thinking a few days later that has resulted in a blog curse as well as an energized feeling! If you read Mandy's post at Enjoy and Embrace Learning before the conference, you know that she was very excited that she would be meeting Ann Marie Corgill, author of OF PRIMARY IMPORTANCE. She did get to meet Ann Marie and she shares her thoughts on both of Ann Marie's sessions. Shelley from Two Learning Journeys posted about her thoughts on Ann Marie's sessions and book. Katie at Creative Literacy shared her learning from Katie Van Sluys, author of WHAT IF AND WHY? LITERACY INVITATIONS FOR MULTILINGUAL CLASSROOMS. And, in his post, " 'I Don't Do Tech.' Really?!?! ", Tony at LearnMeSumthin' shares the highlights of the day which include sessions and informal conversations. As you can see, the day was filled with friends and learning! Chrysanthemum by Kevin Henkes. Used with permission of Kevin Henkes and Greenwillow Books. 3) invite child response or participation. In addition, books are to have an appealing format, be of enduring quality, and meet generally accepted criteria of quality for the genre in which they are written. Florian, Douglas. (2009). Dinothesaurus: Prehistoric Poems and Paintings. New York: Simon & Schuster. Heard, Georgia. (2009). Falling Down the Page: A Book of List Poems. New York: Roaring Brook Press. Hoberman, Mary Ann and Winston, Linda. (2009). The Tree that Time Built. Illustrated by Barbara Fortin. Naperville, IL: Sourcebooks. Hughes, Langston. (2009). My People. Illustrated by Charles R. Smith, Jr. New York: Simon & Schuster. Myers, Walter Dean. (2009). Looking Like Me. Illustrated by Chris Myers. New York: Egmont. Nelson, Marilyn. (2009). Sweethearts of Rhythm: The Story of the Greatest All-Girl Swing Band in the World. Illustrated by Jerry Pinkney. New York: Penguin. Ruddell, Deborah. (2009). A Whiff of Pine, a Hint of Skunk: A Forest of Poems. Illustrated by Joan Rankin. New York: Simon & Schuster. Sidman, Joyce. (2009). Red Sings from Treetops: A Year in Colors. Illustrated by Pamela Zagarenski. New York: Houghton Mifflin. Baskin, Nora Raleigh. (2009). Anything but Typical. New York: Simon & Schuster. Carmichael, Clay. (2009). Wild Things. Honesdale, PA: Boyds Mills Press. Davis, Tanita S. (2009). Mare’s War. New York: Random House. Grimes, Nikki. (2009). Rich, A Dyamonde Daniel Book. Illustrated by Christie, R. G. New York: Penguin. O’Conner, Barbara. (2009). The Small Adventure of Popeye and Elvis. New York: FSG. Stead, Rebecca. (2009). When You Reach Me. New York: Random House. Stoffels, Karlijn. (2009). Heartsinger. New York: Scholastic. Compestine, Ying Chang. (2009). A Banquet for Hungry Ghosts. New York: Henry Holt. Grace, Lin. (2009). Where the Mountain Meets the Moon. New York: Little, Brown. Pinkney, Jerry. (2009). The Lion and the Mouse. New York: Little Brown. Bryan, Ashley. (2009). Ashley Bryan: Words to My Life’s Song. Photographs by Bill McGinness. New York: Simon & Schuster. Osborne, Linda Barrett. (2009). Traveling the Freedom Road: From Slavery and the Civil War through Reconstruction. New York: Abrams. Russell, Ching Yeung. (2009). Tofu Quilt. New York: Lee and Low. Sandler, Martin W. (2009). The Dust Bowl through the Lens: How Photography Revealed and Helped Remedy a National Disaster. New York: Walker. Sturm, James, Arnold, Andrew, and Frederick-Frost, Alexis. (2009). Adventures in Cartooning: How to Turn Your Doodles into Comics. New York: First Second. Black, Michael Ian. (2009). Chicken Cheeks. Illustrated by Kevin Hawkes. New York: Simon & Schuster. Chin, Jason. (2009). Redwoods. New York: Roaring Brook Press. Coffelt, Nancy. (2009). Big, Bigger, Biggest! New York: Henry Holt. Feldman, Eve B. (2009). Billy and Milly, Short and Silly! Illustrated by Tuesday Mourning. New York: Penguin. Gerstein, Mordicai. (2009). A Book. New York: Roaring Brook Press. Mora, Pat. (2009). Book Fiesta! : Celebrate Children's Day/Book Day; Celebremos El dia de los ninos/El dia de los libros. Illustrated by Raphael Lopez. New York: HarperCollins. Patricelli, Leslie. (2009). Higher! Higher! New York: Candlewick. NCBLA 2010 Committee (left to right): Quinn White, Kathy Short, April Bedford, Janelle Mathis-Chair, Jonda McNair, Mary Lee Hahn (not pictured: Mary Napoli, Deanna Day-Past Chair)...and the 30 2010 books! One of the things the Dublin Literacy Conference has been thinking about this year is how to make student learning visible. A component of our conference has always been the display of student work. These have changed over the years. When the conference began 21 years ago, an entire area was designated to students displays. They took up walls and walls of space and celebrated our students' learning. But recently, we have had to rethink these "displays" based on the kinds of work our kids are creating. Jason Blair, one of our elementary art teachers, was the committee member who volunteered to rethink displays. He set up a great area of student digital displays that conference participants were able to see. But, Jason also wanted a place where teachers could try things out, where they could get their hands on some of the new tools. So he came up with the idea of a "Tech Playground". At this year's conference, thanks to Jason's brilliant idea, we hosted our first Tech Playground. One room was designated as a place where participants could play with some of the new tools available to our students. The room had a portable SMARTBoard, Kindles, iPods, Cameras, Flip Videos, Laptops and more. Students and staff were available in the room to help out if needed. The room was a great hit. I went in a few times over the lunch break and the room was packed with participants trying out new tools. It was a fun room with lots of energy--a bit like any Apple Store. I loved the idea of this Tech Playground and have decided to host one for our families in our school library. We've received so many great new tools through various funds for our students at Riverside that I think it would be great for them to be able to share the tools with their families. A Tech Playground seems the perfect idea for families. After talking to some colleagues about the idea, we've decided to host the Tech Playground for Families during our Spring Book Fair in a few weeks. We always host our book fair during parent-teacher conference nights because so many families are in the building. It makes sense to tie the Tech Playground to this time since so many of our parents and families visit the library for the Book Fair. This will give parents another reason to come to the library and it will give everyone a chance to buy books and learn a bit about the new tech tools. Families buying books and playing with new tech tools--it sounds like the perfect combination to me! To continue with the theme of 21st Century Literacies, we collected digital as well as traditional student displays for attendees to view, and there was a "Technology Playground" with a myriad of tools (Flip Video, Kindle, iPod Touch, iPod Nano, etc) for folks to try out. With our children's authors Denise Fleming, Melissa Sweet, and Patrick Carman, we celebrated the joy of reading words and pictures and books that come in multiple formats, and with David J. Smith, the importance of reading the world . The committee, the teacher presenters, and the featured speakers all worked hard to make this conference one of the best of the 21 we've held. And now we are all turning back to our day jobs, hopefully enriched and enthused and challenged and inspired to do our work better and smarter and with the knowledge that all we do every day (whether as teacher, author, or illustrator) does indeed make a huge difference -- a "lovely light" -- in the world. When I was a wee one in summer Vacation Bible School, I loved two things: the frosted animal crackers for snack and the songs. I took those songs to heart. I'd get up early and go out to stand in the middle of the back yard and belt out "Heavenly SUNshine, heavenly SUNshine, filling my soul with glory dee-vi-ine..." and I'd FEEL the glory divine filling my soul. Recently, our winter skies have yielded more tentative sunshine (as above) than heavenly sunshine. We're due for some bright blue skies and warmth. Irene has the roundup at Live. Love. Learn! We are gearing up for this year's Dublin Literacy Conference on Saturday. This year marks the 21st year that we've run the conference and I have been thinking about this year's speakers and reflecting on the ways my own professional learning has changed in the last 21 years. Learning from others--formally and informally--has always been a huge part of my own professional growth. 21 years ago, I had no idea what a Personal Learning Network (PLN) was, even though I am pretty sure I had one. I have always been lucky to learn from so many others who are passionate about kids and teaching. With Web 2.0, our learning networks have expanded in ways that we couldn't have imagined 21 years ago. 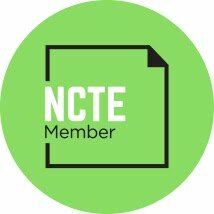 For years, Mary Lee and I had attended NCTE and other literacy conferences and we were connected to a group of literacy educators across the country. We valued what we learned from that group. We looked forward to those few times each year when we could learn from so many of our most important mentors. Learning face-to-face was the only option and we were limited to learning from only the people (mostly literacy teachers) who attended the same conferences that we did. When we started blogging, I remember what fun it was to discover voices of experts we didn't know. We found so many other people out there who had the same beliefs about books and reading that we did. The thing that struck me early on with blogging were the powerful bridges that were being built naturally because of the networking tools that had become available. We never figured our audience would be anything other than elementary teachers. 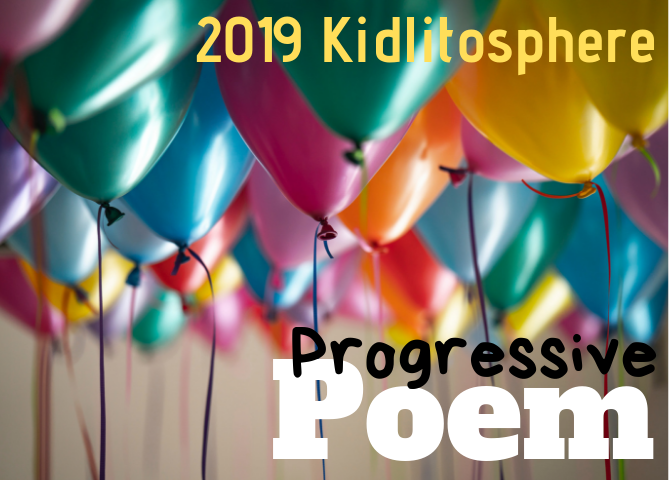 But now, when we say we are part of the "Kidlitosphere," this group includes teachers, librarians, authors, readers, illustrators, parents, publishers, editors, and advocates for children's books. Web 2.0 has helped people come together that had no way of finding each other before. Each person plays a different role and the ability to have ongoing conversations with this amazing group has been powerful. I think this type of thing is happening every minute. Because of all of the networking tools available, we are better able to share expertise and learn from people we may not have been able to learn from before. Just as the Dublin Literacy Conference will host speakers whose expertise is in both literacy and technology, other conferences have done the same. When Kylene Beers chaired the annual NCTE Convention a few years ago, she brought in speakers that talked about issues around 21st Century Literacies. For me, that convention introduced me to yet another group of amazing people whot I could learn from. Two years later, after finding new blogs and networking on Twitter, I am looking to expand my own learning by going to a summer conference that focuses more on the changes that technology is bringing, than one that focuses on literacy alone. I feel extremely lucky to have these networks so readily available. My own professional learning has been amazing over the past few years. I learn from someone new every single day. I worried yesterday when I read the following blog post at LIBRARIAN BY DAY. I absolutely believe that school and public librarians have an important role in new literacies and that funding for libraries is a very important issue. But to imply that we are the only ones who can do this goes against all I believe about the work that we do. To say that any one group (or place) can or should be totally responsible for something so huge seems crazy to me. I know from my own learning, that to presume that others--those with a different area of expertise--are not as important, goes against all that learning is about. It is our work together that will make a difference. I agree with Bobbi Newman at Librarian By Day in the fact that we should all believe that the work we do is the most important work--not because it is, but because when we believe that, it means we are doing the work we are supposed to do. But, we are at a time when we have the opportunity to bring groups together that have never been able to have this kind of ongoing dialogue before. Being open to learning from and with people with different sets of knowledge and skills or different ways of looking at the world can and will have a huge impact on our learning if we let it. I have been in many roles as an educator and the one thing that I am certain of is that each and every role is an important one. None of us could or should do this work alone. It is by bringing our thinking together that we can do our best for children. I believe we are extremely lucky to live in a time when these networks are so readily available. Because I have been able to learn from and with people whose expertise is different from my own, my work is so much better. It has been a powerful experience. PLNs are about more than our own personal learning. It seems bigger than that. PLNs of the 21st Century have given us the opportunity to bring groups together that have never been able to have ongoing talk before. I have already seen the power of that over the last few years. I think we each have a role to play in all of this. We need to take advantage of the ways in which we can learn from people and groups we haven't had access to before. I can only imagine how far we can go as more groups collaborate to share and grow understandings. It is an exciting time to be a learner. I love any new version of THE PRINCESS AND THE PEA. I loved it when I was little and I still love it. 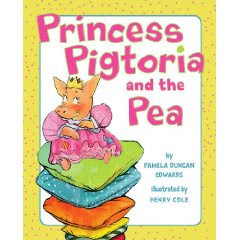 So, when I saw PRINCESS PIGTORIA AND THE PEA by Pamela Duncan Edwards, I bought it, of course! I was expecting to love it because I love all books about the Princess and the Pea. But this one may make it to my favorites list. It is a GREAT story. A smart, independent princess. Princess Pigtoria was very poor. So, when she saw that a rich prince was looking for a bride, she went to Porksville to apply. The pig was a little arrogant but she enjoyed her time by hosting a pizza party before she goes to sleep on several mattresses (under which, of course, the Prince has placed a pea). I don't want to give the ending away, but be assured that the princess gets the happy ending she deserves. The alliteration in this book is pretty fun--not so much that it gets in the way of the story, but it just adds to the fun. This is a princess story I am extremely happy to add to my collection. When I look at the nonfiction books that we weed from our school library, they are often encyclopedia-like books that don't seem to have been written for children. So many older nonfiction children's books are like that. The field of nonfiction books for kids has gotten so much better over the past decade. Now our kids have great nonfiction to read--stories that are interesting and written with kids in mind. One of my worries is that kids love nonfiction but don't always have the stamina to read anything longer than a magazine article. They check out nonfiction often but when I chat with kids about the books, it becomes clear that they enjoyed the photos but didn't read much beyond the captions. Stocking our library with great nonfiction on topics that kids can't help but be interested in will hopefully build a stamina for nonfiction and help students find great topics that are interesting to them. A new nonfiction book I picked up at Cover to Cover this week is SAVING THE BAGHDAD ZOO: A TRUE STORY OF HOPE AND HEROES. This is a great read. I read it at my kitchen table in one sitting. This is a 60ish page book with great photos spread throughout. 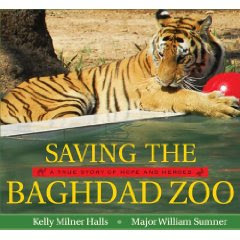 It tells the stories of many of Iraq's zoo animals that were saved from terrible conditions. In the introduction, Major William Sumner says, "During my time in Iraq, I was asked repeatedly why we were helping the animals and not the people of Baghdad, but I believe that we were doing both." After reading the stories of rescues throughout the book, this statement becomes so clear to readers. Saving the zoo animals was such an important thing for so many people. The book begins with some basic history and general information about what was found when people were sent to check out the state of the remaining animals in the zoo. Following the first two chapters, different animals are highlighted. We learn about rescues of a variety of animals over a period of time--bears, Arabian horses, camels, lions and more. Each story can stand alone but together, the stories show the impact of what was done to save these animals. This book would make a great read aloud for upper elementary students if you are looking for quality nonfiction that can be read over several days. One of the big reasons that I have been working with my 2-5th graders on stopmotion and film creation is so that they become critical readers/viewers of information. I believe there is no better way to understand how to analyze information than to learn to create it yourself. The lessons aren't about stopmotion or teaching a certain program. Instead, they are building a conversation about analyzing what you see and deciding whether it is credible. One of my favorite pieces from AASL's Standards for the 21st Century Learner is: Maintain a critical stance by questioning the validity and accuracy of all information. After 2 quick lessons, student are watching film a bit differently. A few weeks ago, many of the students merely believed what they saw because they saw it. Now, after sharing some video tricks and inviting kids in on the creation process, they are realizing that things are not always as they appear. This week, I plan to show a few video clips to further illustrate the importance of critical viewing of information. Here are a few clips that often work well with kids in upper elementary. I first saw this clip at a workshop years ago where I learned about Concerned Children's Advertisers. They have other PSAs that are great for teaching kids to think for themselves. As part of their 20th Anniversary, CCA is hosting a Media Literacy Campaign. These clips can serve so many purposes in our teaching. They are a great conversation starters about reliable information. Just because it is on a video doesn't necessarily make it true. How do you check your information? These clips can also serve as great nonfiction mentors for our students. Many of our grade levels write literary nonfiction. and I love using these "fake" nonfiction pieces to really analyze--what language and tone do they use to convince us of the information? How is this "nonfiction" writing different from narrative? It is always powerful to teach students the language of good nonfiction through films like these. I find that great video clips like this can serve lots of purposes in our teaching. I am on the lookout for lots more! So, I have been noticing that I LOVE Amy Krouse Rosenthal lately. I've loved so many of her new books and SPOON has been quite the hit in the library. 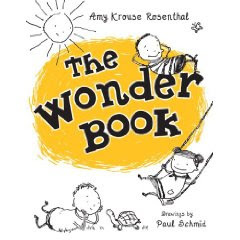 Today, at Cover to Cover, I picked up a new poetry book titled THE WONDER BOOK and when I saw that it was written by Amy Krouse Rosenthal, I bought it without opening it. The girl doesn't ever let us down. She is quite amazing. THE WONDER BOOK is a great addition to any home, classroom or library. It is a fun book that is all about joy. The inside flap tells us that the book addresses so many things that Amy Krouse Rosenthal often wonders about. (for example, Does Miss Mary Mack have friends who liked other colors? and Who hid something under the tooth fairy's pillow when she was a little girl?) Lots of poems and stories that are just pure fun, a little advice, some reminders about table manners and more. Here is a book trailer with a few words from Amy about her new book. As often happens when I find an author that I realized I've loved for a while but haven't really paid attention to, I checked out her website, made sure I had all of her books, etc. Come to find out, I would like Amy Krouse Rosenthal even if she weren't an author. She is the best. And it seems that Mary Lee also discovered all of the amazing things that she does which she shared some of on last week's POETRY FRIDAY. If you visit her website, I am sure you will agree too. First of all, I didn't realize she had so many adult books out. I will need to check those out. But my favorite find was Amy's short videos. How have I not known about this before? Amy is all about joy and has started her own little mission on beckoning the lovely. You need to spend some time watching how it all began in August, 2008. Then go watch what has happened since.. You can visit her site The Beckoning of Lovely to see it all in one place. I would now like to buy a yellow umbrella. Imagine what a great place the world would be if more of us carried yellow umbrellas around and gathered people in this way. She is amazing. And check out Mission Amy K.R.. I think we should all live our lives like this. If there is no Amy Krouse Rosenthal Fan Club, I think we need to start one soon. We could all carry yellow umbrellas. This makes me smile. I hope it does the same for you. Is it poetry? I say YES! It's a list poem, illustrated with video images, and accompanied by music. Amy Krouse Rosenthal is the author and the music is by Elizabeth Mitchell. I need to remember #5, #13 and #14 as a teacher, but I need to write #20 on the bathroom mirror so that every day I remember to slow down my crazy life just a little bit! Lee Wind (I'm Here. I'm Queer. What the Hell do I read?) has the Poetry Friday roundup this week. Head on over to check out this week's poems. There are six five four three NO slots open in the roundup schedule for the next few months (see sidebar). Would YOU like to host a Poetry Friday roundup? Stay tuned in June for a new call for hosts! This is a story about the power of art. The stick is clever. He's one sharp stick, making up algebraic equations and poetry in its head. But the stick is silent. He has no voice. No way to describe the sunset or tell the chipmunks where there are more acorns. The stick is so depressed that he drags himself home in the sand...and notices the beautiful lines he makes. The stick creates a beautiful tapestry in the sand that is "the most magnificent sight the forest had ever seen. The animals cheered, the insects buzzed, and the trees swayed their branches in approval." Even though a rainstorm washes the tapestry away, the stick knows it doesn't matter -- he can make another. "He knew at last he had found his voice." John Lechner's (author*illustrator*animator*designer) website. Be sure you watch the book trailer for The Clever Stick. This is a story about accepting yourself. Spoon feels like his friends have it so much better than him. Knife gets to cut and spread, Fork gets to go everywhere and do everything, and Chopsticks are cool and exotic. What Spoon doesn't realize is that his friends are jealous of him. Spoon's mom reminds him that he's the one who gets to dive headfirst into a bowl of ice cream and relax in a cup of hot tea. And in the end, when Spoon can't sleep, there's something he can do with mom and dad that the other utensils can't! Amy Krouse Rosenthal's website, where I learned that "Chopsticks" (follow-up to "Spoon") is forthcoming in 2011. I read this new book to our first and 2nd graders but I think the 3rd graders would also enjoy it. Amelia Bedelia is a little girl in this new book but she has the same issue with language and literal meanings as she does when she gets older. Amelia, as a child, is quite adorableWhat I like about these books is that they are so kid-friendly. The stories are school stories that the kids can relate to and the play on language is done in a way that young children can understand. In many of the instances, when Amelia misunderstands something that someone says, we see her thinking in a thinking bubble. A great invitation to conversations about the literal meaning vs. the intent of the language. I think these books are a great bridge to the more difficult Amelia Bedelia books for transitional readers. I am looking forward to more to come out in this new series. Gooney Bird and her classmates are learning to write poetry. They write very short three or four-word poems, haikus, couplets, limericks, and list poems. We get to watch Gooney Bird help Barry revise his list poem. At the end of the book, the class is just about to start writing poems for two voices when their teacher's mother dies. Together they write a poem for MANY voices for their teacher. This would make a great read aloud before or during a poetry writing unit. Gooney Bird's teacher, Mrs. Pidgeon, (who is on our list of 100 Cool Teachers in Children's Literature) can remind all teachers of the importance of differentiation. I want to be more like Mrs. Pidgeon, starting tomorrow. And I definitely DON'T want to be like the substitute in this book. We've had a great couple of weeks working with FRAMES and Stop motion. The kids are learning so much and their creativity is so fun to watch. I only have each class every four days so kids have only had about two 20-minute blocks of time to work, but their growth is so amazing. I've even had about 15 kids ask to come in during recess a few days this week so that they could work a bit more. That extra time allowed them to problem solve a few things. I think if you walk in and see what kids are doing, it looks like it is just a fun thing. But in reality, I think creating video can be a key to becoming critical readers and viewers. As I continue to reflect on documents that help us think about how literacy is changing and growing as the tools change and grow, I am trying to figure out ways to get this into our kids' days. All of the 21st Century Frameworks and Standards (NCTE, ALA, P21) address the importance of visual and media literacies. It is going to become more and more important for our students to be critical viewers of information. What I am finding goes back to what I understand about the writing process. If kids write regularly, they become better readers. And if they read regularly, they become better writers. The same holds true for any type of media creation. If our students have time to create multimedia projects, they start watching things differently. Just as they learn to "read like a writer", they are already learning to "view like a creator". Already this week, kids are coming in with examples from the real world of TV and YouTube telling me about a commercial they saw and thinking about how and why it was created. For our kids to become critically literate, this includes not only text but visual information. I find that giving them the tools to create is the best way into this kind of thinking. I happened to find a great book at the Scholastic Book Fair a few months ago. I put it aside not thinking much about it but picked it up again this week. I do believe that books come to you when you need them and this one was perfect for this week. This book meets so many of the needs that I have right now. The Klutz TRICKY VIDEO book was a huge hit this week. 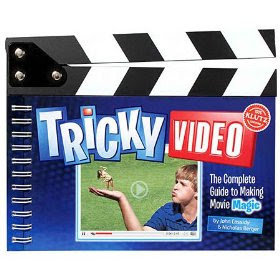 In the book, there are 20+ video tricks shown with the how-to for kids to try. The book shares some pretty interesting tricks and makes them very accessible to kids. But the best part is the accompanying website. I couldn't have been happier when I discovered it. The site is www.klutz.com/tv and it is an ad for the book. But it leads you to the page that shows you the 20+ video segments discussed in the book. The clips are short and fun to watch. At the end of each clip, you are directed to the pages in the book where the creation secret is revealed. So, this week's lesson was quite fun. I shared the site and we watched a few together--trying to figure answer the question: How did they do that? Knowing that lots of kids would want the information from the book, I purchased 3 copies of this book. I kept one in book form and cut apart the other two so that I could post all of the pages on foam board posters around the library. This way, lots of kids could use the foam boards to figure out what was going on. Kids picked them up and took them to their spots near their laptops. Other groups gathered at the foamboards and had great conversations about what was going on. I love the invitation that these foamboards created. I will keep these handy in the library, hoping that kids carry them to their work areas when creating film, etc. A great tool for viewing and creation. TRICKY VIDEOS is one of my favorite finds of the year. I have been thinking about all of this since September when a student asked, "How did they make that?" after watching the book fair video. When thinking about visual and media literacy skills, Klutz has made it easy for us, as teachers, to get kids thinking about these things. The combination of website with videos and book of explanations was absolutely brilliant of KLUTZ. Such a great learning tool for kids. And a great learning tool for teachers too--so many things made accessible for those of us who don't understand how these things work. I can see so many great benefits of film making for kids and this book helped provided has been a great resource for my own thinking as well as my students'. Poetry Friday -- What Are You Trying To Accomplish? After Tai Chi on Wednesday, I was talking to a retired university professor about teaching. It all seemed very casual and surface-level, until he asked me, "What's the most important thing you hope to accomplish in the nine months you have your students?" Whoa. That kind of upped the ante of the conversation all at once!!! Whether or not you're a teacher, see if you can come up with an answer right now -- what's the most important thing you hope to accomplish this year? My answer? That my students will love to read. Love to read and CHOOSE to read. And I want them to learn to THINK. To curb their impulsivity and THINK before they speak or act, to know how to store information in their brains and retrieve it when they need it again, to be able to figure out what to do with new information or information in a new format. ...And I guess, come to think of it in retrospect, I also hope they will be good conversationalists. I hope they'll be the kind of people who will either ask thought-provoking questions, or the kind who will be able to come up with a good answer when asked. Mary Ann has the Poetry Friday roundup today at Great Kid Books. If you are interested in hosting the roundup, check out the schedule in the sidebar and pick an open week that works for you. Leave your request in the comments, or email me directly at mlhahn AT earthlink DOT net. I am trying to spend a tiny bit more time reading books that aren't usually my type. As a K-5 librarian, I have to have books to recommend to all readers and I have discovered that some readers make it easier for me. We have the same tastes. So, I know that in order to do my job well, I need to expand my reading a bit. When I was in the classroom, I had lots of fantasy and sci-fi readers and I could recommend books and series but I didn't feel like I had to know as many as I do now. I only had to know books to recommend to the 26+ kids in my class. If I knew them well, it was easy to read books with them in mind. Since this is the 2nd year in this school, I am just starting to know many of the kids as readers. I've noticed that there are lots of books that kids are reading that I just can't talk about. The 5th graders can't get enough of The Percy Jackson Series. I am not always a huge fantasy fan and this book didn't look like one I'd like. So, I put it off. But, I realized a few weeks ago, that I really needed to see what all the hype was. I read THE LIGHTNING THIEF and LOVED it. I so understand the excitement and I can't wait to see the movie. Tony at Learn Me Sumthin' has been reviewing books on his blog that I wouldn't normally pick up. But after I so loved LIGHTNING THIEF that I had so adamantly avoided, I decided to give a few others a try. I finished POWERLESS by Matthew Cody (recommended by Tony) last weekend. It is about a boy who moves into a new neighborhood. Many of the kids in the neighborhood have super powers. Some can fly. Others are strong, etc. He is the only one of his friends without a power. But there is a little mystery in the town. Kids lose their powers (and the memories of those powers) on their 13th birthdays. No one can figure out why but they decide they need to. POWERLESS is a fun story. It has the elements of a superhero comic book but is a good story with a pretty apparent theme. The whole concept of the story is fun and I found myself wanting to continue reading to see what happened. This is a longer book--close to 300 pages. I think it would be a great fun read for 4th and 5th graders and I have a few 5th grade boys I'll recommend it to this week. I am learning to stretch myself a bit as a reader in this new job and I'm glad that I am. I have discovered some great books that I wouldn't have otherwise discovered. With some of our Scholastic Book Fair profits this year, I was able to purchase a SMART Board for the library at school. We couldn't afford the entire system but Scholastic offers the Interactive Whiteboard piece in their Book Fair Profits catalog. Since we have a projector and speakers in the library, I decided I'd add one piece at a time as we could afford them and I am glad that we did. It might take us a few years to get the whole thing pulled together but it works well for now. As part of the purchase, I was entitled to a one hour orientation. Michelle Wolfe is our SMART Board rep and she contacted me to set something up. Instead of giving me the orientation, I asked her if she'd be willing to give an orientation to a group of 3rd graders. Michelle happily agreed. Over the past few years, I have been thinking about how we can use these tools to meet the needs of our 21st Century Learners. I keep going back to the documents such as NCTE's Framework for 21st Century Curriculum and Assessment, ISTE NETS for Students, and Partnership for 21st Century Skills' Framework for 21st Century Learning. I've been reflecting on ideas in articles like "It's Not About the Tools. It's About the Skills". I worry that we are using some new tools in ways that don't really change learning for our students. This article about the announcements of Apple's iPad reminded me just how important this was. For me, the important points from all of these documents are the focus on creation, communication, purpose and audience. I want to make sure that the SMART Board in our library becomes a tool for students instead of a tool for teachers to give information. My thinking was that if we want the SMART Board to be used as a tool for learning--as something beyond a teacher tool, it was important that kids be familiar with and able to use the board. So, we put together a team of 20+ 3rd graders who will serve as our initial Think Tank. They volunteered for the position, knowing it would mean giving up recess time throughout the year. They were quite excited about their first meeting learning all they could about the board. Michelle was great--introducing them to many of the tools available on the software. Many had not had much experience with the SMART Board so they loved the whole nature of the touchscreen. We decided to place the SMART Board on a wall in the library that is a little bit off to the side. Because so many of the "walls" in our library are windows, we were limited in our options. But I think the place that we chose will work well. It is a spot where a whole class can gather if needed. But it is also off to the side so kids can work on the SMART Board while other things are going on in the library. It is not front and center. The students who were trained will be able to play a bit with the SMART Board over the next few months. I think that tinkering time will be critical. I think it will take a while for the newness of the tool to wear off but I think that as they play, kids will have great ideas for the kinds of things they might create. Another tool to communicate their learning, to problem solve, and to design. I imagine they'll design games, figure out ways to include their own photos, etc. use the software to revise writing, storytelling, and more. I'll plan to meet with the team every few weeks to reflect on things they've learned, share some new things and brainstorm how the boards can be used to better support their learning. I introduced Stopmotion Animation to several classes in grades 2-5 this week during library time. One of my goals this year is to give kids lots of possibilities for creation. I want them to see how things are created and invite them into the creation process. With lots of new tools, our students will have lots of new ways to communicate their learning. As part of a district grant that we received last year, we were able to put FRAMES on our entire laptop lab in the library. Since kids have had so much success on PIXIE, we thought FRAMES was a great way to expand their work to animation. I think that if our students can see how different forms of media are created, they will become much more critical users of information, which is so important. FRAMES has turned out to be a great tool for introducing animation to kids. It is easy to use and kids can see the process for creating animation and then they begin to watch animation a bit differently. Because the program FRAMES has a camera feature, and I am working with our art teacher to create a claymation project with 4th graders, I figured it was a good time to introduce the tool to lots of kids. I have done a lot of reading on Kevin's blog and have been inspired over the year by the things his kids do with animation. He has so many great ways to work with kids in creating stopmotion. I've followed his reflections carefully and need to revisit them. Mary Lee's "Setting Up My Desk Area"
This time around, sharing these were to let kids know many of the things that can be done with this. We will most likely revisit some of these later to look more closely at craft, message, etc. Today was just an invitation in. Kids jumped in realizing how the things they've seen recently were made with this technique. Many kids mentioned a scene in iCarly in which Spencer creates a stopmotion movie. Following the samples, I showed them, in just a few minutes, the basics of how to create stop motion with photographs in FRAMES. That meant teaching them to use the camera, demonstrating me taking several pictures of myself with slight changes and then playing the results. The total length of the lesson was about 10 minutes which included examples of Stopmotion as well as the intro to FRAMES. My best teaching has always happened when I throw a few basic ideas out to kids and let them play. I can then use student work and discoveries in future lessons. I find that if I am too focused on product at first, kids produce things that look like mine. In order to let them explore and find new ways to use the new tools I've been introducing, I want to give them lots of play time with little direction so they are free to figure things out and open up possibilities for everyone. Just as I expected, this 10 minute minilesson really gave kids a way into this type of creation. Kids jumped right in and had a ball. And, they came up with things I would never have thought of. It was fun to watch different classes and different ages approach the same introduction. I learned so much watching different kids' spin on the software. Kids came up with such great ideas and kids began to build on each other's thinking. The younger kids immediately began to do what they do best--tell stories using props such as puppets, magnetic sets, etc. Some students used legos to try to capture the sequence of building. Others used board games to try to capture the moves on a strategy game. Others found some of the dramatic play toys that we have in the library and began retelling old favorites using stopmotion. Others used books, objects sitting around the room, a train set in the building toy area of the library, their own faces, and more. They were able to see so many possibilities in the 20 minutes they had to play. Many left with plans for their next visit and many asked to come in and add to their creations during lunch. My hope is that these eventually become possibilities for them to share their learning. When they need to share or present information, this gives them a new way to synthesize their learning. A new way to share their thinking with others. So often, as teachers with new technology, I think we are hesitant about introducing something that is new to us. We feel the need to learn it well first. But I think that might be holding lots of us back from getting our students' hands on these new tools. I learned the very basics of FRAMES--just enough to invite them to give it a try--in about 10 minutes. Then as kids played and I watched, I learned so many more about the tool as they discovered them. I think it was a richer experience than it would have been had I known the entire program well because the kids were in charge. Except for the few things I knew, they had to problem solve to figure out the others. I also think that because I didn't have much experience with it, kids were able to go off and try a variety of things rather than only the 1-2 things I shared. They knew it was open tinkering time and I think that is critical. Even as I write this, I am amazed at how much kids did in just 20 minutes. I can't wait to see where they go next and what they do when I introduce ideas such as storyboarding, clay animation, etc. It will be interesting to hear their conversations about the things they notice outside of school--times when photos are manipulated, etc I didn't realize how much they would learn from this one tool. Kevin Hodgson will be doing a session for teachers on digital storybooks at our Dublin Literacy Conference later this month. He is also doing a parent/child session on stopmotion that is getting huge response. Looking forward to learning more from him and the other speakers then. We have a great art teacher at our school. He is always busy doing great work with kids and is always thinking about big picture. This year, he organized a visit by a local artist, Michelle Stitzlein. She visited our school for two days last week and kids were able to work together to create pieces that will be put in our school courtyard. 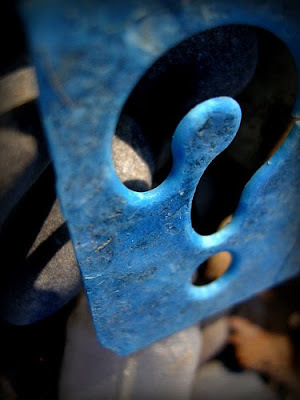 Much of Michelle Stitzlein's art is art with recycled materials. We began the two day visit with a whole school assembly where Michelle shared her own art. It was amazing to see the creative process and the places she gets her ideas. As part of her slide show, she talked about her travels and the inspirations she finds for her art in different areas of the world. She also shared examples of other things she's found in her travels that have been created from recycled materials. Shoes, houses, etc. created from things that once had a different use. It was a fascinating presentation for both children and adults. She had so much to say about art, creativity, inspiration, taking care of our world, and more. All in such a short time. For months, to get ready for the visit, our kids have been bringing in plastic bottle caps. Creating sculptures with children, using bottlecaps is one of her specialities. And her book LITTLE BOTTLECAP BOTTLECAP gives families lots of ideas for more projects they can do at home. It was amazing to see how many bottlecaps we collected at our school over the course of the last few months. And it was amazing to see how many sizes and colors bottlecaps come in. For the two days that Michelle visited, each class was able to join her in the gym to work on one of the community pieces that were made. Before her visit, classes painted the pieces. During her visit, the kids worked in small groups to choose the best caps for each space, decide on the placement of the bottlecaps, and use drills to secure the caps to the pieces. We ended up with several great large pieces, many of which will be placed around our courtyard and other places in the school. This was a great visit. Michelle was amazing with the students. I am sure she opened up lots of possibilities for our students in terms of creativity. I love community projects and the focus on recycled art was a great theme, I thought. I think her work with kids will have a lasting impact in so many ways. We are lucky to have such an amazing local artist to work with our students.